The Quinnipiac Univeristy poll found that 49 percent of New Yorkers disapproved of de Blasio, while only 24 percent of New Yorkers approved of the New York City Democrat. De Blasio did not fare better on his home turf, as 48 percent of all New York City residents had a negative opinion of the mayor and potential 2020 presidential candidate, while 36 percent of residents viewed him in a positive light. Even de Blasio’s fellow Democrats had an unfavorable opinion of him, with 38 percent of Democrats viewing him in a negative light. The Democrat New York City mayor has not officially announced a presidential run, but he had told CNN’s Jake Tapper in a January 2019 interview that he would not “rule things out” for 2020. 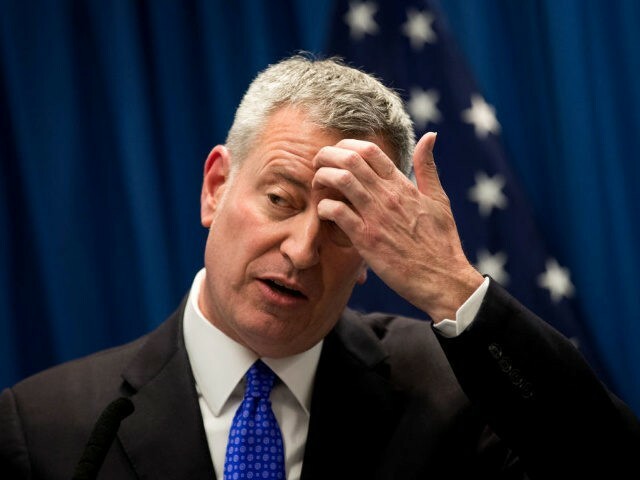 “For New York City Mayor Bill de Blasio, who hasn’t yet decided whether he’ll run, his statewide net favorability rating is at an all-time low since taking office in 2014,” said Quinnipiac polling analyst Mary Snow. While de Blasio’s popularity at home has taken a nosedive, the New York City mayor has hit the road to campaign in the first three presidential primary states of Iowa, New Hampshire, and South Carolina. De Blasio is also hitting the speaking circuit in Washington, DC. The American Israel Public Affairs Committee (AIPAC) announced Thursday afternoon that de Blasio would be speaking at the upcoming AIPAC Policy Conference.